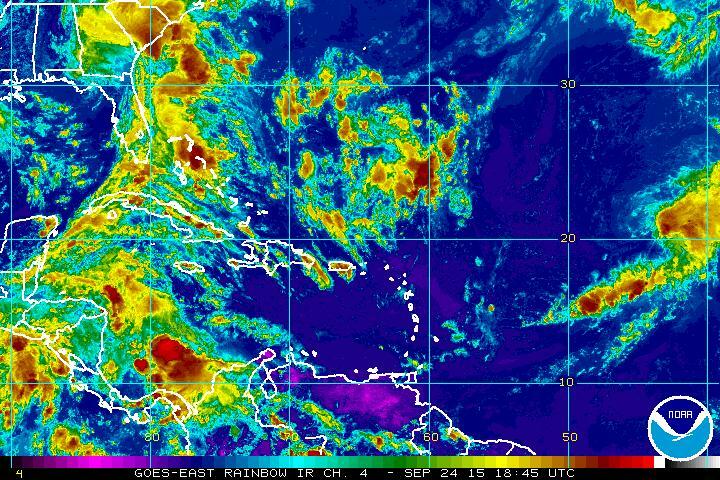 UPDATE: Tropical Depression Ida disintegrated into a remnant low. MIAMI, Florida - As of 11 a.m. Eastern Standard Time on Thursday, September 24, 2015, the National Hurricane Center has issued a public advisory due to the presence of Tropical Depression Ida which is located over the central Atlantic about 1195 miles east of the Northern Leeward Islands. T.D.. Ida is moving toward the north-northeast at 5 mph (9 km/h). A gradual turn to the north should begin tonight, according to NHC forecasters. Ida continues to remain somewhat disorganized and the storm's intensity has deteriorated, according to satellite imagery. However, the tropical cyclone still has maximum sustained winds of 35 mph (55 km/h), with higher gusts. The NHC expects little strengthening during the next 48 hours. Most spaghetti models for Tropical Depression/Storm Ida are in agreement that the storm will move in a north-northwesterly direction over the next 2-3 days. After day 3, spaghetti plots forecast that Ida will turn to the west and have an increase in forward speed. As for intensity, the GFDL, which brings Ida to hurricane strength in 4 days, remains an outlier and is discounted as a reasonable solution. Conversely, the ECMWF and GFS global models show Ida weakening as a result of an unfavorable environment, with the GFS even showing the cyclone degenerating to a trough by day 4 or 5. Because of these more believable scenarios, the NHC intensity forecast is a little lower than the previous one at the end of the forecast period, and overall is very close to the Florida State Superensemble.